There were two exhibitions at the École nat. sup. darchitecture Paris Val-de-Seine, housed in the fine late nineteenth century factory (now listed and protected as a historic monument, and recently restored) built for the Société Urbaine dAir Comprimé (SUDAC) and with the message in large text on its frontage: ‘Distribution d’air Comprime‘. Recollections was a show of pictures by Philip Jones Griffiths taken in Britain from the 1950s  1970s, with plenty of reminders of what a fine photographer he was. It appears to be showing also at the National Conservation Centre in Liverpool from 17 October 2008 to 15 March 2009, and their site has half a dozen images and some text. You can also read more and see some other pictures on the Trolley Books page about the accompanying book. The Paris show did not have the slide-show of his Vietnam images which is apparently at Liverpool, and there is also a slide-show linked at the top of the Trolley page. This show  like the John Bulmer show Id seen the previous day, was also a reminder of a vanished past – some gone for good, but in other ways very much for the worse. The Jones Griffiths show covers a much wider range of political and cultural events, and there is always an insistence on stating the photographers point of view in his work. One image that particularly appealed to me (you can see it small and dark on the Trolley site) was taken in Downing St, outside the home of the Prime Minister. It showed four nannies with a couple of prams and a push chair who had stopped – as they did every day while taking their young charges for some air – to chat to the two policemen on duty outside the door of No 10. Now the west end of the street is walled off, and there are security gates on Whitehall, and they would need to apply several days in advance to go down the street – after passing through an airport-style security gate. You can see many of Jones Griffiths finest images on his Magnum pages, including in the slide show there a number that were in the show. Surprisingly, the book Recollections does not yet feature on the site. Patrick Tourneboeuf’s giant colour pictures of spaces behind the scenes or being redeveloped in his ‘Monumental, etat des lieux, (shown in Los Angeles as ‘The Museum Project‘) were also impressive. For once the scale of the images had a purpose, confronting us with these spaces almost on the same large scale as they actually existed, giving the feeling one could walk into these empty halls and spaces under repair. I was particularly impressed by an image of the Théâtre du Châtelet, its balconies and stalls wrapped in plastic and the workmen in hard hats at the bottom left. It is also a project that reflects the much greater support that photography enjoys in France compared the UK. 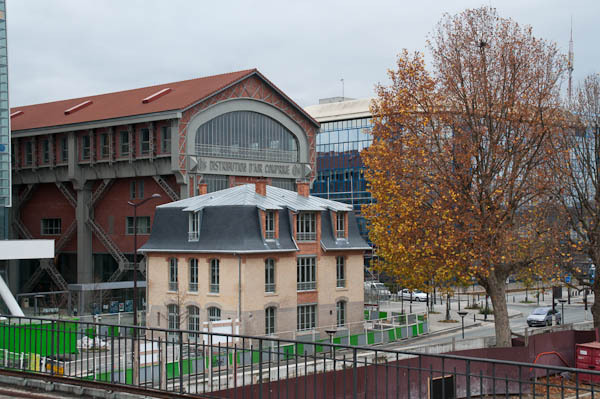 The project began with a carte blanche commission from the French Minister of Culture in 1997 to photograph the renovation of the Pompidou Centre; other official commissions followed on from the success of his work there. This entry was posted on Friday, December 19th, 2008 at 08:20 pm and is filed under My Own Work, Photographers, Reviews etc. You can follow any responses to this entry through the RSS 2.0 feed. You can leave a response, or trackback from your own site.